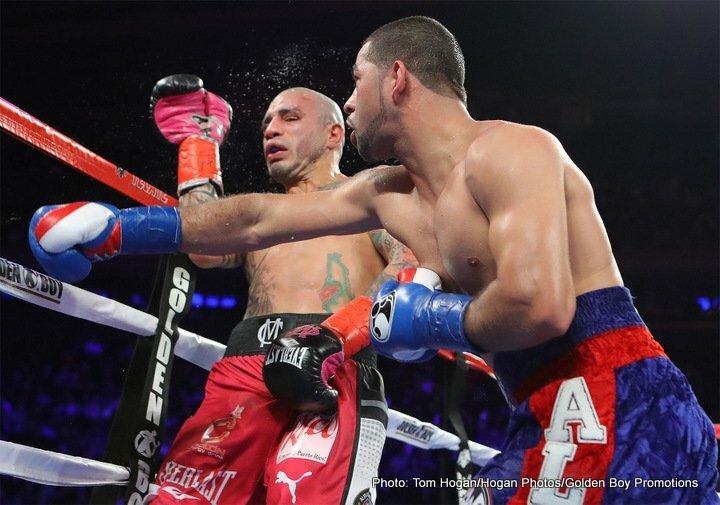 Sadam Ali (26-1, 14 KOs) says it would have been a different story if Jessie Vargas was inside the ring with him last Saturday night instead of Miguel Cotto at Madison Square Garden in New York. Ali beat Cotto (41-6, 33 KOs) by an impressive 12 round unanimous decision to win his WBO junior middleweight title. Ali, 29, thinks he would have beaten Vargas (27-2, 10 KOs) to avenge his 9th round knockout loss to him last year in March. Ali was overpowered by Vargas’ big right hands in that fight, and dropped twice in the fight. Vargas has fought only once since that time in losing to Manny Pacquiao last year in November 2016. Vargas is scheduled to fight on December 15 against journeyman Aaron Herrera (33-7-1, 22 KOs) at the Pioneer Event Center in Lancaster, California. “If Jessie Vargas fought me tonight, it would be completely different,” said Ali last Saturday night after his win over Cotto. “I learned from it. He was the better man that night,” said Ali. It’s probably true that it would have been a different story had Vargas been in there with Ali last Saturday. Ali looked a lot bigger, stronger and a better fighter than the one that struggled against Vargas last year. Ali isn’t offering Vargas a world title shot against him. If a rematch is going to take place, it’s likely going to need to be a situation where Vargas moves up in weight to the 154lb. division, and works his way into title contention. Right now, Ali has bigger fish to fry than to fight a once a year fighter like Vargas. The inactivity is hurting Vargas’ career at this point. If he wants to stay relevant at 147, he’s going to need to get active, because it’s been almost 2 years since he won his last fight. “He only fights once every 2 years,” said Ali’s promoter Oscar De La Hoya talking about Vargas to the media. The media burst out laughing at this point. In fairness to Vargas, it’s now been 13 months since his last fight against Pacquiao in November of last year. Vargas needs to stay on his management’s case to get them to setup more fights. It would be a shame if he’s out of the ring for another year after the Herrera fight. “I could go back down [to welterweight]. Who knows?” said Ali. “I don’t have nobody to call out. Whoever Golden Boy picks, that’s who’s going to get it. I’m not dodging anyone,” said Ali. There’s nobody at welterweight that is ready to fight Ali at this point. He’s better off holding onto his WBO junior middleweight title and defending against his mandatory challenger Liam Smith in his next fight. Golden Boy isn’t saying anything about what Ali’s next move will be. “He definitely was the bigger guy, and he was aggressive,” said Ali about Cotto. “At this point, I don’t know what’s going to happen. I might or I might not [move back down]. I didn’t know he was injured. I saw him retreating a little bit. That was when I took charge,” said Vargas.